If you are a Android Tablet user, you have probably experienced losing data due to accidental deletion when you unintentionally hit the delete button. The call lists, pictures, videos, games, audio files, and text messages are all important to you and losing them could have relevant impact on your personal life and business transactions. Data loss could be devastating especially for pictures, videos, and text messages because there is no way you can have them back except if you have the common sense to create back up for all the files in your Tab. But what if you didn't? It may take a long time to get the names and numbers that you keep but by contacting people you know, you can have your contact list again although it might take time to accomplish the task. However, your other files such as pictures, videos, and text messages are as good as gone forever. Indeed, losing data could put you in a predicament especially if you have pending transactions with details stored in your tablet. However, nowadays, there is convenient way of recovering data from your Android Tablet - Android Data Recovery. 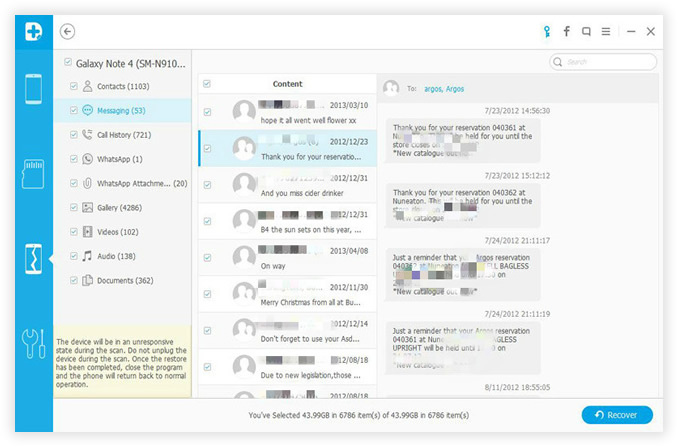 With this software, you can retrieve and restore data at the fastest and most convenient means. 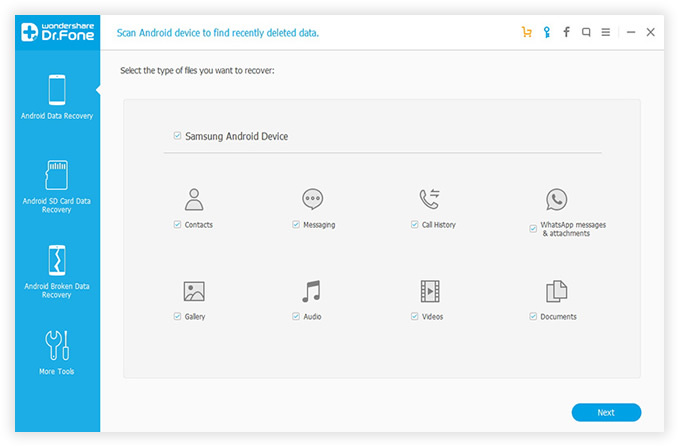 It can be able to retrieve deleted or lost data as long as the storage system has not been rewritten, it can deeply scan and recover lost file from Android tablet no mater how it lost, including hardware failures, accidental deletion, factory reset, software update and other reasons. Supported Files : Photos, SMS, Contacts, Call History, Music, Videos, eBooks and other documents. Supported Tablets: Samsung Tab, Acer Tablet, Amazon Tablet, LG Tablet, Deel Tablet, Google Tablet.etc. First of all, install the application on your computer, (Windows and Mac version are available now). Then launch it. Connect your Android tablet to computer via USB. The program will detect your Tablet, please make sure make sure these options have been opened: USB debugging, USB connected. 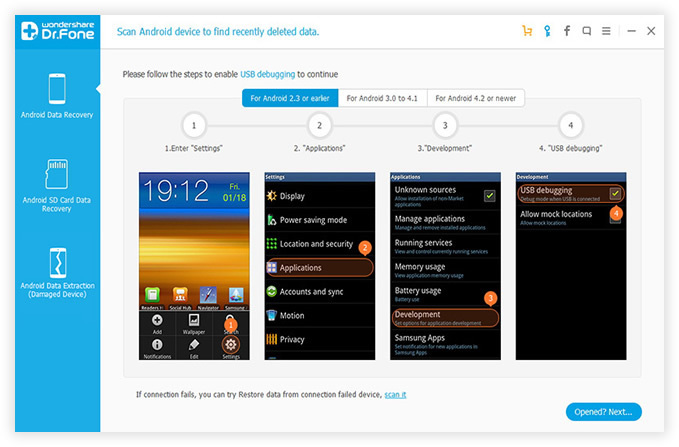 Different Android version have different ways to set USB debugging. You can intuitively see the Screenshot commands to enable debugging or follow the steps below. 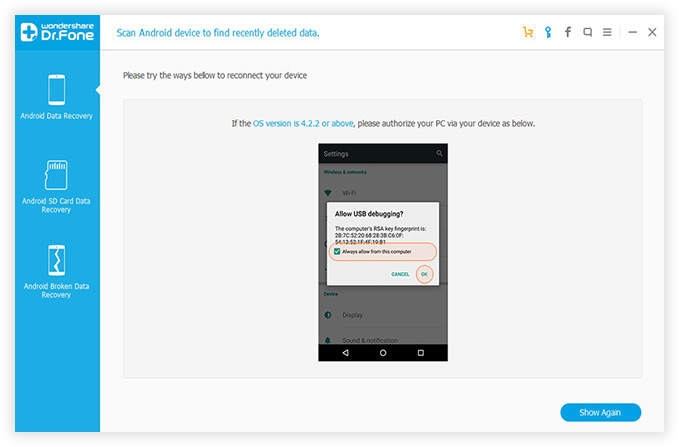 In this step, you need to authorize to the program so that it can identify your Android system, just check your Tablet's home screen and click "Allow" to let the scanning task move on. Here you're allowed to select the type of files you want to scan and recover. If you only need to retrieve photos from your Android tablet, just mark the "Gallery" and Next, this will significantly reduce the time of scanning. Generally,the scanning process may take some time because the internal memory and SD card need to be surfed. Keep the USB connecting to your computer always. When the scanning is complete.All lost data will be displayed for your perusal.You can directly click each file to preview if this is what you want, then click the "Recover". 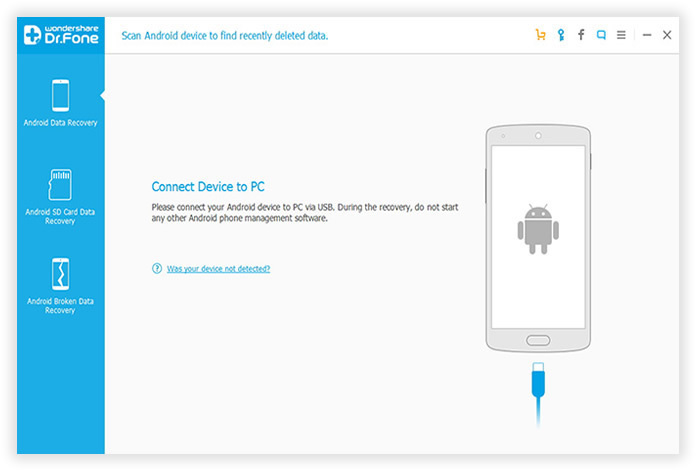 There are no Android recovery programs can guarantee that they can 100% recover lost data. In other words, it only works under some constraints, the lost data can be recovered only till the time that memory has not been overwritten, you should stop using your tablet once you find the deleted data is very important. Once the "Original data" was overwritten by new data, your invaluable data is lost forever. If this is the case, I still suggest you try Android Recovery program to scan your device, don't give up the last choice.